After they defeated Detroit in the Eastern Finals, the Bulls then took on the Los Angeles Lakers for their first shot at the championship. 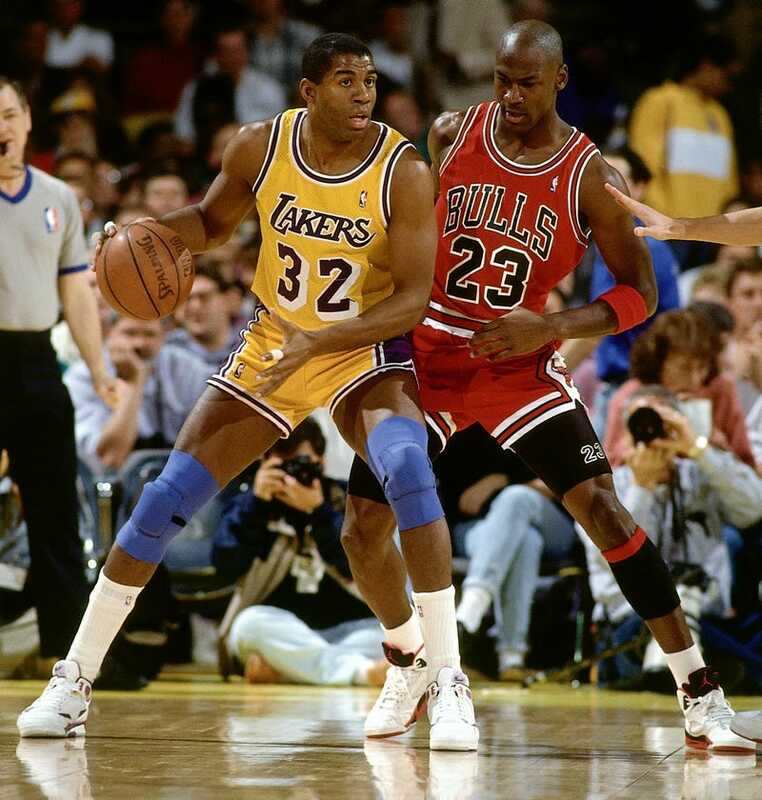 It was the Lakers' ninth visit to the Finals in the age of Magic Johnson, which began in 1980, eleven years earlier. Both Kareem Abdul-Jabbar and Michael Cooper were gone, and by all odds this should have been the twilight of Johnson's career, but he was still a superb player on a powerful team. If there was a decline in his on-court play, it had yet to be exploited by opposing teams. Johnson still had a stellar cast, including James Worthy, Sam Perkins, A. C. Green, Mychal Thompson, Byron Scott, and Vlade Divac. The Lakers, coached by Mike Dunleavy, won fifty-eight games that year. Some of the old razzle-dazzle from the earlier Johnson years was gone, and the Lakers used a more deliberate offense now, designed as much as anything else to conserve energy, but they were still a formidable team, and their players were accustomed to all the media hype and the accompanying disruption of the NBA Finals, unlike the Bulls, save of course for Michael Jordan, who dealt with that kind of media pressure every day of his life. This matchup was exactly what NBA and NBC executives had long wanted: the raw young gunslingers from Chicago up against the savvy old pros from Los Angeles, the older, incumbent superstar against the ascending one, the player much of the country longed to see in the Finals. In a way, it was a battle of two great smiles. Magic Johnson had a brilliant smile, which if anything seemed more a permanent part of his countenance than Michael Jordan's. Jordan's smile was more controlled, as befit his character—it might have a higher wattage, but he flashed it more sparingly, only on select occasions such as championship-award ceremonies, and photo shoots for his varying commercial sponsors. That selective rationing made it more effective with the public—the fierce face of the warrior suddenly gone, replaced at the end of the game by a smile that reflected the incandescent pleasure of the victor. Johnson's smile was much more his signature on the court; he seemed to take constant joy from the sheer pleasure of playing, and it was easy to forget how intense and demanding he was, how hard he pushed his teammates, coming down on them immediately if he sensed some slippage or carelessness in their game. "Forget Magic's smile," his longtime teammate Mychal Thompson said. "That's not who he was. He was like Ali, and Ali smiled a lot too. But what they both wanted was nothing less than to kill you."